Chipboard wheel and ATG gun now available! Need I say more? Check the wheel out here and the ATG adhesive appilcator here! Croppin' in the OC was all it was expected to be! The Crops2Remember Weekend Crop in Lake Forest, CA, was this past weekend and 24 motivated croppers were there, enjoying the fun and festivities while still getting some pages DONE! As a matter of fact, Heidi S. had 43 pages done by Saturday night, earning her a Gold Scissors award! Terrie D. from Kerman, CA, repeated and took the honor of Queen of the Crop, complete with tiara donated by the Diva Craft Lounge (thank you Danielle and Rayme!) 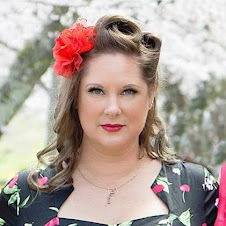 Cyndi, also from Kerman, was our Page Challenge Princess, and each received the appropriate accolades at our Saturday awards night, "The Scrappies," where the Golden Scissors are awarded to six lucky ladies for various achievements, from page design, to creativity, to blogging. 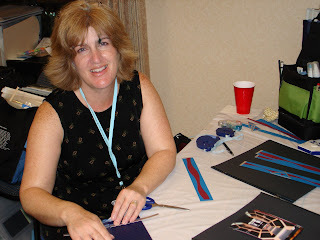 Judy O. from Lake Forest left more than 20 comments on the C2R blog, earning her lots of raffle tickets and, ultimately, the Golden Scissors Baroness of Blogging award! A number of surprise guests made their way to C2R throughout the weekend: Laura Miller from Desert Scrappers Weekend Retreats; Daisy from Eclectic Paperie; Robin from SoCal Scrap; Stephanie Ackerman from Home & Heart Magazine (with her very TASTY chocolate chip cookies to share ... get the next issue of the magazine for THIS recipe, ladies, the price of the pub is worth it! ), and lead Fiskateer #2, Cheryl Waters, who shared some inspiring ideas, tool knowledge and a fabulous prize basket that lucky Elena won! 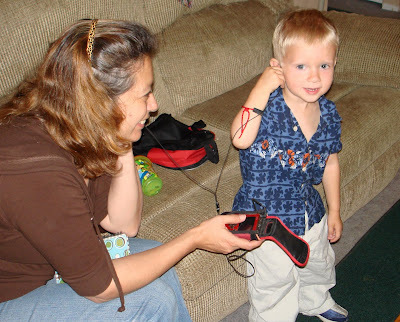 To see more pictures of the fun we had, go to the C2R blog! Thanks to all the attendees and my fellow co-hosts, Nan and Naomi! It was a blast! Crop-a-dile II Big Bite now available! 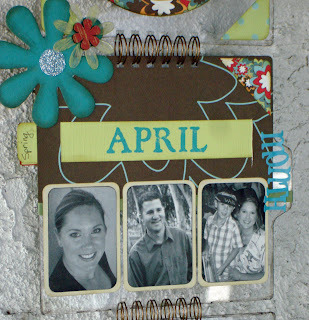 Scrapbook Royalty Crop in Tustin - register and win! Kits2Remember is proud to be a sponsor of the Scrapbook Royalty "From the Heart" charity crop at The Red Bee in Tustin, CA, May 31, benefiting the Tyree Family. Here is a bit about this family: Priscilla Tyree was a stay at home mom caring for their four children (Sophia, Camille, McKenzie & Miles) one of which is still in diapers. George was a wonderful husband to Priscilla and a devoted father to his children. George had been experiencing very strong headaches and on Sunday, September 16th, 2007, he was admitted into the hospital. The doctors ran some tests and found that he had an advanced stage of acute leukemia. On Monday night George went into a coma and by Wednesday night, George passed away. George's unexpected and sudden death has left his family devastated. Please don't miss this opportunity to be a part of bettering the quality of life for the children that George has left behind. All proceeds/donations/profits will go towards gas & grocery store gift cards for the Tyree Family. 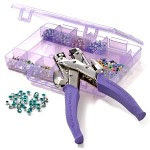 K2R has donated fifty 12 x 12 acrylic home decor project kits for croppers to indulge in, and up-and-coming local scrap instructor Liz Hernandez (Memoriez by Liz) has been gracious enough to donate her time to teach the project to the "From the Heart" croppers. Registration is going on now and anyone who signs up before May 1 and comments about it here will get a FREE 5-page 6 x 6 acrylic album, delivered to them at the crop. For more information about the crop, log on to the Scrapbook Royalty web site. Krew Kit #2 now available! I couldn't believe how quickly we sold out of our first Krew Kit! Thanks to all of you who bought one ... I hope you're having fun creating with it! If you are so inclined, email over a photo of your completed project! We'd love to see what YOU did with it! Send it to: jessica@kits2remember.com. The newest Krew Kit is now available! Unleash your inner teenager with this bright and funky collection featuring BamBop!, Me & My BIG Ideas and (of course) acrylic! This kit has enough goodies for TWO projects: one that is 6 x 6 and one that is 4 x 4. Project ideas will be up soon on the K2R web site and K2R Krew blog, so buy your kit now before they're gone! Besides, you may want to stop buy the Krew's blog every so often ... you never know when they might give away a RAK! Other new items include our affordable Think Pink! Project Kit. 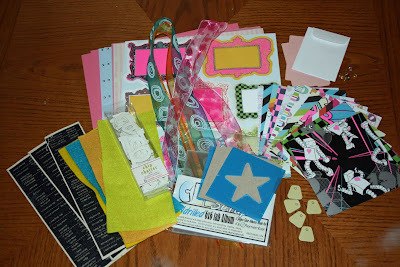 For only $9.99 you'll get a bag full of goodies, chipboard and acrylic worth more than $25! These are also limited, so order fast! And don't forget Mom! 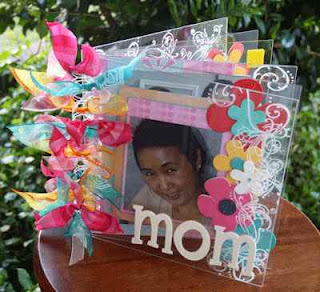 We've got two great acrylic kit projects for you to create for Mother's Day this year: "A Tribute to my Mother," and "Mom." The "Mom" kit comes with a full 42-letter chipboard alphabet, so it can spell out any title you want! Both kits come with a link to full-color, step-by-step instructions, so you'll learn new techniques for using acrylic, stamping and more! And our Stadium Albums are getting some buzz, too! In this post, there is a photo of the 8-inch Happy Birthday album using the new Basic Grey Cupcake line. These albums are fabulous - and affordable at $12 for a 6-inch and $16 for the 8-inch! Now that K2R has hit Utah, we are now headed for the next major Expo: The Great American Scrapbook Convention in Arlington, TX! And, as always, we are looking for a few good volunteers. If you are interested, email me for details: jessica@kits2remember.com. I will also be teaching a class at the show. Log on to our calendar for more details, or to check out the local SoCal stores and crops where K2R will be! While my Mom, Nancy, and I packed for snow, sleet and chilly weather, Utah was actually having a "heat wave" with daytime temperatures hovering around 70 degrees! I guess we brought some of the SoCal warmth with us! However, the mountains had plenty of snow on them, so spring was truly just starting! Desert Scrappers Weekend Retreats organizer Laura Miller also rode along with us, going to the Expo to give the Utah scrappers info about her crops coming up in Las Vegas. The Scrapbook USA Expo was a lot of fun and I had a great time getting to know the local scrappers, many of whom had not yet played with the Bind-it-All or acrylic. It was exciting to see the more adventurous scrappers' faces light up at the prospect of working with these things and a number of them hung out in the booth for an hour or more, doing the make and take, checking out the ideas and asking questions. As for the Expo, it was a scrapbook shopper's paradise. A number of manufacturers were on hand with great steals and deals: My Minds Eye, Fancy Pants, Scenic Route, Scrapworks, Three Bugs in a Rug, Advantus (think Heidi Swapp and Cropper Hopper), Creating Keepsakes (the Lisa and Becky lines), plus some other, smaller manufacturers with some great niche products! Page kits are apparently popular in the Beehive State, because there were a large number of page kit companies on hand. Overall, there were more than 80 vendors and this is clearly a big event for the community - the local morning show even broadcasted live from the center of the crop area! I want to take a moment to thank my Volunteer Krew: Lisa, Sarah, Elizabeth, Michelle and Holly. Without you guys, the booth and class would not have run nearly as smooth! Thank you so much for your time, enthusiam and great amount of help! Plus, being local gals, they were able to give some great tips about the area and the scrapbookers who live there. It was a great sneak peek into the scrap community before we take the SoCal to Provo Bus Tour up there for CKU Provo! Oh, and if you are planning to go to CKU, don't forget to register next week! Now here is a state that I have been in for about 30 seconds. 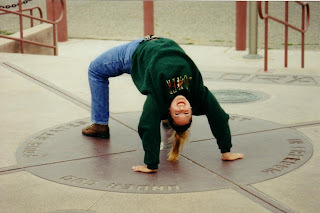 Well, actually, only my left leg was in it, I believe, when I did a back bend over the Four Corners spot in 1999. I am really looking forward to seeing the great state (well, at least as much as I can from I-15!) and going to the Scrapbook USA Expo. I have a great volunteer Krew scheduled to help me in the booth and an acrylic/Bind-it-All class scheduled for Saturday afternoon. No time for a class? 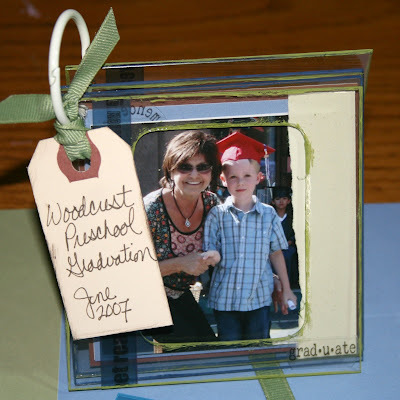 No worries, we have a great 4 x 4 acrylic album make and take too, for only $4! Find out more here: Scrapbook USA Expo. At the very least, please be sure to stop by the K2R booth and say "hi" if you're attending! Also, since I will be out of town, any orders placed between now and Monday will be shipped on Tuesday, April 22 (Earth Day and my Dad's Bday!). Thank you for your patience and understanding! K2R is getting warm and fuzzy ... we are doing 12 x 12 acrylic home decor project kits for Scrapbook Royalty's May 31st crop at The Red Bee in Tustin, CA, to benefit the Tyree Family. Volunteer Krewmember Liz Hernandez has been kind enough to donate her time for teaching the class, as I am already committed elsewhere. So, Liz, thank you very much! So, not only can you spend the day cropping with friends, but you can help others while doing it! If you are interested in finding out more about this incredible, affordable crop (Prima's a sponsor and local scrap celebrity Donna Salazar will also be teaching!) 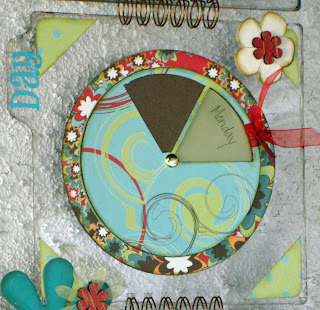 log on to www.scrapbookroyalty.com. New products and a RAK giveaway! "MOM" Mother's Day 8 x 8 acrylic album: We have had a lot of inquiries about this project and it is now available for purchase! Click here for more details! Krew Kits are here! I don't know about you, but I LOVE the challenge of working with pre-selected products! The kit club industry is going strong, so I think there are a lot of us out there! But I don't like the restrictions and policies of monthly clubs. So, I have come up with limited quantities of Krew Kits. 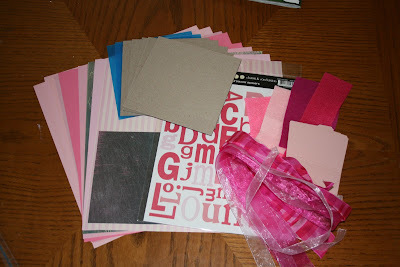 These are designer product kits that have papers, embellishments, acrylic, chipboard, etc., in them to create a projects (or projects, depending on your preference!). 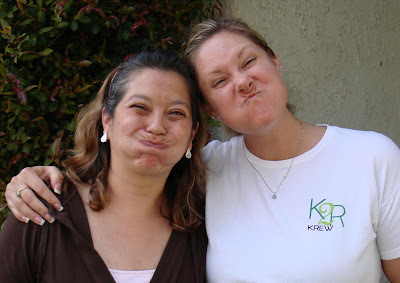 What will happen is this: Each month (or so) the Design Krew and I will come out with a new Krew Kit, and then post the projects we made with each on our blogs, along with helpful hints as to how to make the project. This month, Krew Kit #1 features double-sided printed paper from new company Paper Trunk, as well as their very cool and creative chipboard spinning wheel. 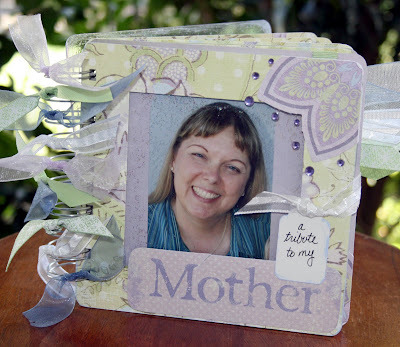 There is also an 8 x 8 acrylic album from Clear Scraps, five yards of decorative ribbon and a handful of flowers and embellishments. The photos above (aside from the MOM kit) are photos of the home decor calendar I made with the kit. Acrylic isn't just for albums, of course! I made this because my kindergartner, Will has been studying days of the week, months of the year, season, etc. I figured this would be a fun way for him to change the date each day. 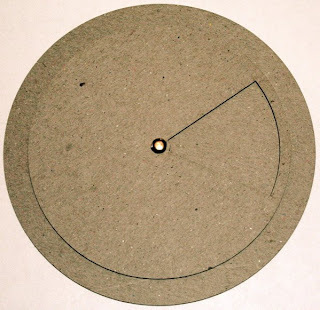 He will spin the wheel for the day of the week, change the month (which also denotes the season) by sliding in the correct cardstock piece and move the circle to the right date (it's attached with thin elastic). 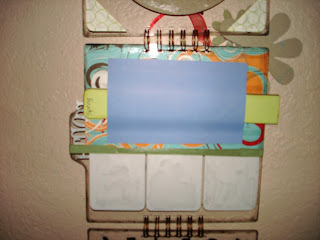 The bottom panel is for notes, such as important dates, field trip info, grocery lists, etc. I also wanted to make sure that none of the monthly slides would get lost, so on the back side of the month panel, I made a slide pocket to store them, lining the stored slides up with the one showing in the front, so there wasn't anything hanging out from the back. I did add a few items to the kit from my stash - I was happy to use some things up! I used some scrap cardstock for the monthly slides, the thin elastic, which I inked, an office binder clip for the notes panel, Scenic Route alpha stickers, Creative Imaginations foam stamp alphas (numbers and months) and chipboard letters (the "today" part), brown distressing ink, Espresso and Willow acrylic paint dabbers from Ranger and Diamond Stickles (I blinged up the numbers). 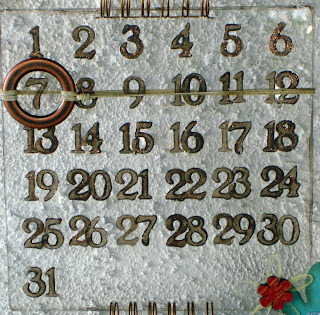 I also made a template grid to place under my 8 x 8 acrylic to make sure my calendar numbers lined up OK. If you purchase the Krew Kit, email me at jessica@kits2remember.com and I will email you a copy of the grid if you want it. The rest of the supplies are all in the kit. Wanna see what else you can create? The K2R Design Krew will be blogging about their project for the next week, but you can get a sneak peek on the Kits2Remember idea page. The Krew Kits come in very limited quantities, so be sure to order today! The Krew's "Blog and Win" RAK: The Design Krew is giving away an 8 x 8 acrylic album this week! For details, check out their blog: www.k2rkrew.blogspot.com. While attending CKU Anaheim last summer, I had the pleasure of meeting an avid scrapper from Mexico's national capitol, Rocio Cano. While scrapbooking is expensive, and, therefore, not as popular as it is here in the United States, Rocio is single-handedly trying to introduce the latest scrapbooking trends to her scrappy friends back home. Rocio arrived Thursday to stay with me for the weekend; she wanted to learn the ins and outs of working with acrylic so she could take the information and supplies back to Mexico City to share. Acrylic has not yet been introduced there, although there appears to be a great interest in it. So, of course, during her visit, we first went to Michaels and JoAnns Thursday night as a scrapbooking "appetizer," to whet our appetites for the day-long acrylic seminar the next day. Friday, I walked Rocio through a number of acrylic projects, showing her how to use different binding methods, inks, paints, layering techniques, etc. We took a break for lunch and shopped at Angel's Scrapbook Garden in Mission Viejo, which is, unfortunately, going out of business and nearly the entire store is 40 percent off. We both stocked up on a number of goodies there! Next, we went back and finished up a couple of the earlier projects, discussed necessary supplies and then went over to Scrappy Nan's in the evening to crop with her and Laura Miller (Desert Scrappers Weekend Retreats). I loved hearing about the scrap community in Mexico and enjoyed practicing (and us both laughing at my attempts to speak) Spanish, which included learning the true lyrics to the gringo birthday song "La Cucaracha" beyond the fact that it is about a cockroach. But I must admit, today's activity was the most fun! Rocio, Nan, Nan's daughter Marli and I hit the road to some of our favorite scrappy spots. First off: the Fabric Barn. Anyone who is anywhere near the Long Beach, CA, area at any time and LOVES ribbon has got to stop here. They have thousands of ribbons at fabulous prices and you cut what you want by the yard. Or, you can buy the whole spool for larger projects. Anyway, all three of us did some damage to our pocketbooks at that store! 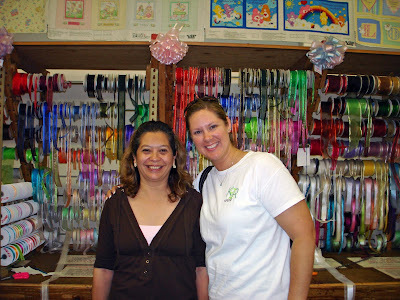 Then it was off to Strictly Scrapbooking in Cerritos and The Red Bee in Tustin, both stores that feature a wonderful selection of supplies. Rocio was able to find a variety of supplies for a fraction of what they sell for in Mexico City and I was able to get some good ol' scrapbook shopping done - something I have not been able to do for quite a while. Now I just need to find the time to USE it all! Sadly, Rocio had to fly back to Mexico City tonight, an extra suitcase in tow. She was delight, not minding the fact she had to room with my 2-year-old Xan (pictured sharing her iPod above) or that she had her "acrylic seminar" in a dusty garage. 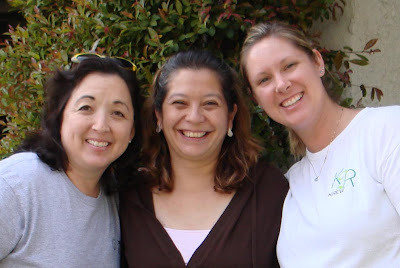 Thanks, Rocio, for a fabulous time! Please come back any time! One of the main reasons (aside from wanting to own my own business and have fun doing it!) I started Kits2Remember was because it is difficult for me to find a well-paying job in my career because my military family moves so much. A number of people have said I would be a great store owner, and I would love to own a bricks-and-mortar store, but my husband is a career Marine now and Marine Corps families move about every three years. By the time I had a store up and running profitably, I would have to pack up and move again. So, going online and vending at expos and conventions seemed to be the smartest way to go for me and my family. It turns out my business plan wasn't created in vain. Despite news to the contrary in January, the Marine Corps now considers my husband overdue for a move, so he has been reassigned to become an air traffic control instructor at the Naval base in Pensacola, FL. We just found out about this three weeks ago and have not yet worked out all of the details. I DO know that Kits2Remember will continue as it has been, attending Expos and crops; I will continue to teach classes and share the latest and greatest products and techniques. My DH and I will be traveling to Pensacola in mid-May for a week to look for a house and check out the area. We will physically move from California to Florida in July. K2R now has the opportunity to make an impact on both coasts! Now, what does this mean for K2R, the Expo, CKU Provo and Creative Escape? Not much, really. I will be flying back to California for weeks at a time to fulfill my commitments - and have FUN! I still hope to teach at the local SoCal stores when I am in town. I do have some store classes planned for July that I will have to postpone or cancel, but those are the only changes to my scrappy schedule at this time. Whew! The stores I supply acrylic to on the west coast won't have to worry about additional shipping - my family will assisting with those orders, still shipping from California. Most web orders go out via flat rate boxes, so there won't be any shipping impact for my online customers, either. And as for Expos, I plan to continue to do the California shows I did this year, and adding East Coast shows as early as the Tampa, FL, Scrapbook Expo the first weekend of December 2008. The CKU Provo bus tour from SoCal to Utah and back is still on and a number of the stores are already lined up (find out more at www.ckubustour.com). And instead of driving out to Creative Escape in Mesa, AZ, I will be flying in - I'll just have to watch how much shopping I do! Now, I need to find out what scrappy stuff is going on in and around Pensacola. If you know of any stores, crops or scrappy events going on, let me know! I am looking forward to discovering what's hot in the southeast! And, as always, thank you all for your support and enthusiasm for K2R. Without you, it would not be what it is today! 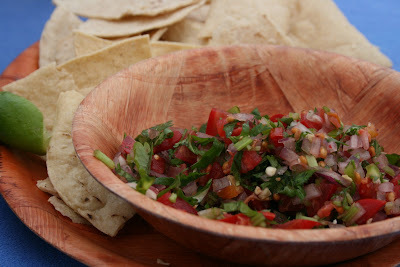 These are fabulous and I can;t keep them in stock at Expos! These are by publisher Design Originals and feature either transparent cards or albums. 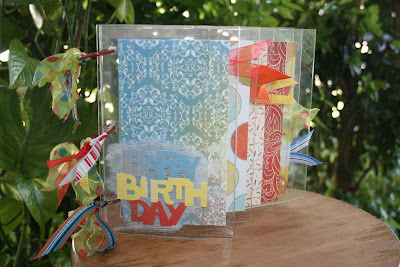 "Clearly Classy Albums" gives you some tips on working with clear albums while "Clearly Cards" shows you some "clearly" fresh ideas for your greetings and paper crafts. Click on the link above to take a look! A new kit line from K2R! These kits are finished in 15 minutes or less! Really! And they are perfect for gifts. I started with three 4 x 4 acrylic albums with an acrylic cutout cover. "Graduation" features a rectangular cut out; "Military Dad" features a star cut out and "My Man" features a heart cut out. These are so cute and very affordable. Be sure to check them out for the upcoming graduation, Memorial Day and Father's Day season! If you are using the Crop-a-dile or Fiskars handdrill to punch holes in your acrylic and chipboard minibooks, you may want different colored o-rings to match your project. Check out the 7Gypsies O-rings now available at K2R! Here are some pictures of my DH, Rodney, and I enjoying the cruise along Baja Mexico. 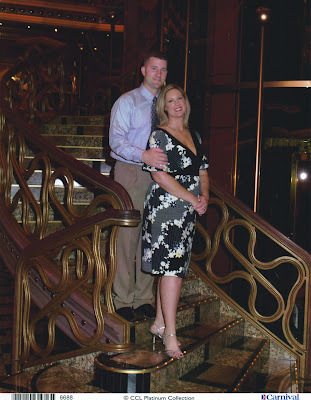 This is the first cruise we had been on and we had a great time shopping, playing with dolphins and playing some Texas Hold 'Em! Now, I'm ready to jump back in to the real world!